At the entrance of the port, many ships went aground. When you approach the port, just follow the steps below. No shortcut. 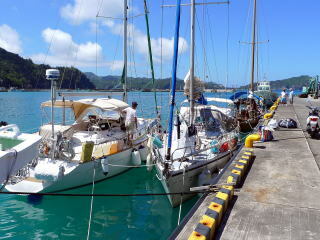 1) Put your boat at 27 04.7N 142 09.000E off the port. You may draw a line to this point from a point off Hachijo-jima Island. 2) At the point above, you may see Maruyama lighthouse（27 04.8N 142 12.5E) and white-colored Kaname-iwa (Kaname-lock) mark in the east. 3) Then, head to the white-colored Kaname-iwa mark. At night, follow the white color of the directional lights of Maruyama lighthouse to keep out of the sunken rocks. 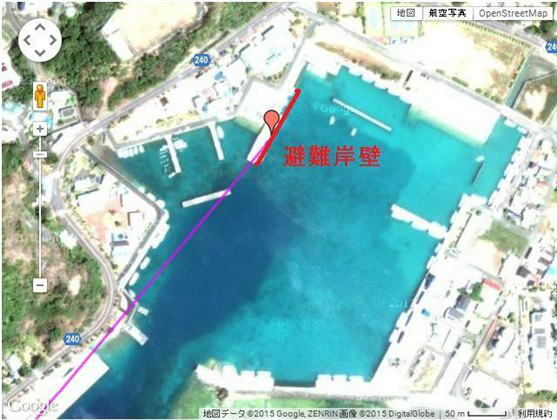 4) Turn left at a right angle at 27 04.7N 142 11.9E before Kaname-iwa, and head to the point 27 05.500N 142 11.900E off the white light house of Futami Port. While the lighthouse has white-colored body, it is sometimes called the “blue” lighthouse by local people, because it sheds a blue light at night. 5) Once you reach the point off the white lighthouse of the port, move to the point 27 05.63N 142 11.7E inside of the lighthouse. 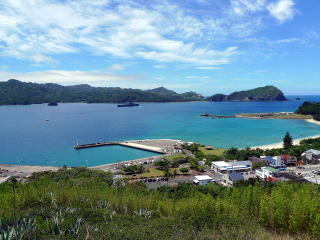 6) Then, turn right and head to the fishing port. 7) You may see the red lighthouse at the entrance of the fishing port. Passing the red lighthouse to your right, move into the fishing port. 9) You may also see big buildings with green colored roofs behind the one-line breakwater. 10) The quay in front of the buildings is called Type 4 Refuge Fishing Port and has a painted sign 「避難岸壁」, which means Refuge Quay in Japanese. 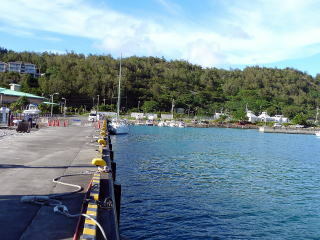 11) It is the quay berth where you may moor your sail boat. 12) In the past, sail boats can be moored behind the white lighthouse. It was convenient for living. But, I recommend the Refuge Quay berth where is calmer as it is in the fishing port. There is a slope behind the quay. Water can be taken at a water tap at the park or the toilet. If you need more water, call at the village office. 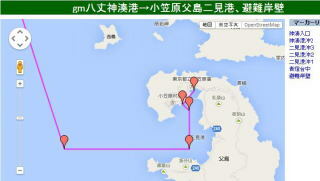 A big water tank truck will come to your boat with a cost of just JPY735/ton. There is a western style toilet 3 minutes away from the quay. While there is no public bath house, many of toilets have shower systems. Fuel is at a gas station. 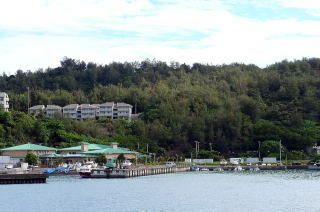 There are a CO-OP shop and a medium sized supermarket at the main street along the shore. No problem with shopping foods. There are many restaurants at the main street. But, many of them are closed after the ferry leaves for Tokyo. There are many drinking places at a street behind the main street.